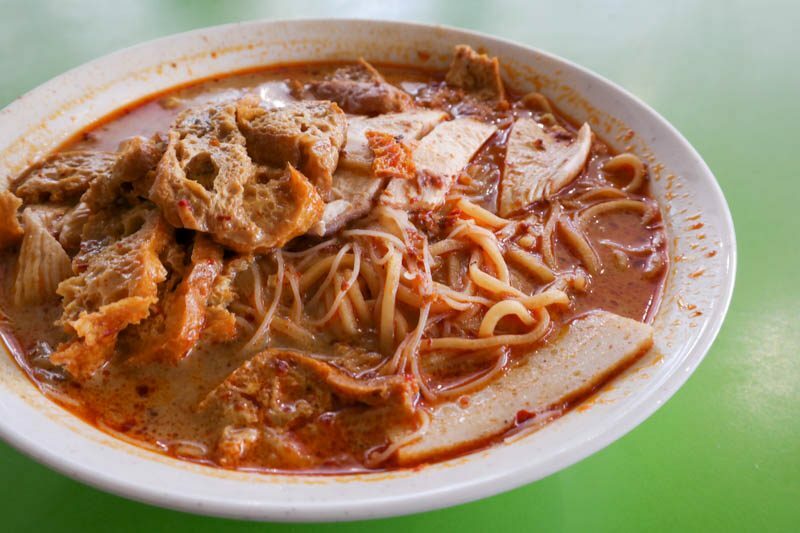 Walking around in Bedok Hawker Centre, it is hard not to notice the long queues for Hock Hai Curry Chicken Noodles. 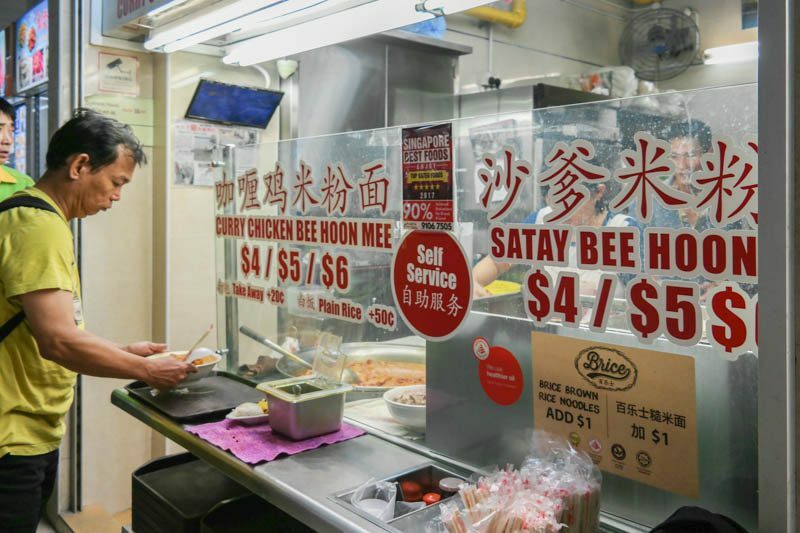 This stall has been around for many years; even before the renovation of the hawker centre in 2013, but business remains just as good. 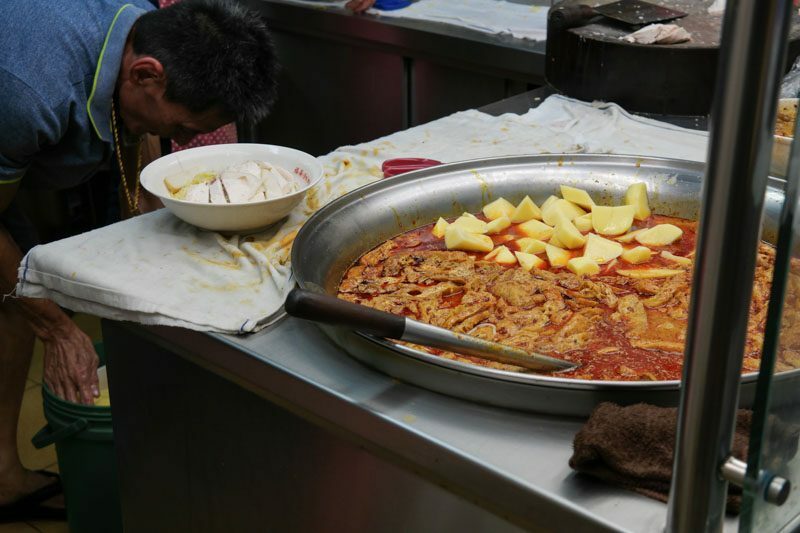 Upon a closer look, you’ll see a huge pot of curry filled with ingredients, and smell the aroma of freshly cooked curry. It was extremely hard to resist and I’ve found myself queuing up for this bowl of noodles many times. 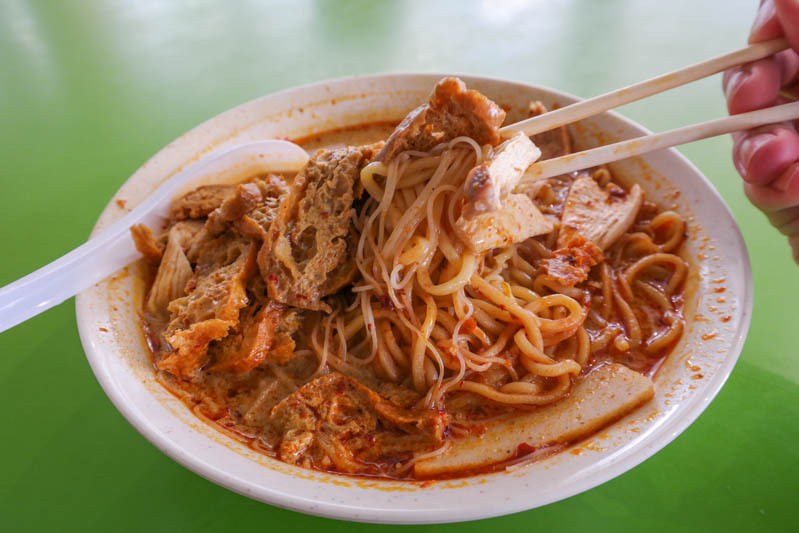 Although the signboard says Hock Hai Curry Chicken Noodles, this stall also sells Satay Bee Hoon, but it seems like the Curry Chicken Noodles remain as the sole reason why people flock there. 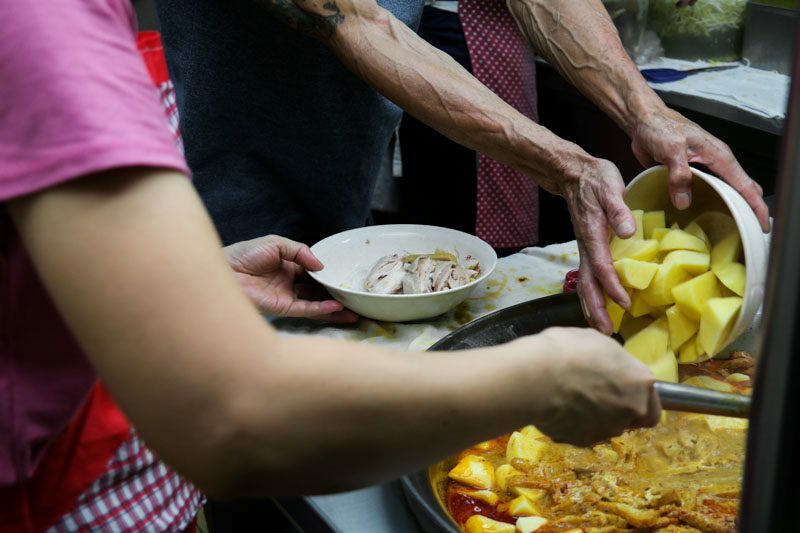 The business was so good that the old couple was constantly seen replenishing ingredients into the boiling curry. Unfortunately, I did not get any potatoes in my bowl, maybe the Aunty forgot to include them, or they needed more cooking time? Before pouring the curry into the bowl of noodles, the Aunty mixed everything in the big pot together first, to ensure that my bowl was not filled only with the chilli oil on the surface. 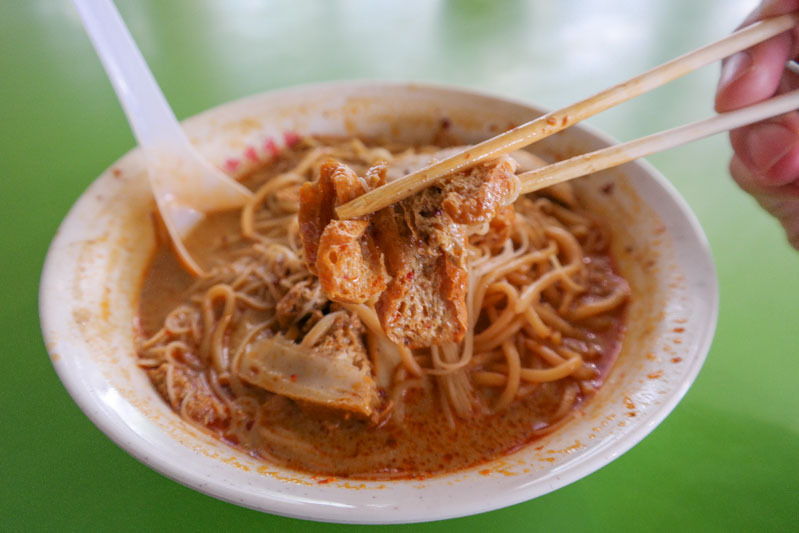 The Curry Chicken Noodle ($4) came piping hot and brimming with ingredients. I couldn’t wait to tuck into it. I ordered the smallest size but was greeted with this giant bowl of curry noodles. Each time I order from this stall, I get surprised by the amount of food that can fit into the bowl. 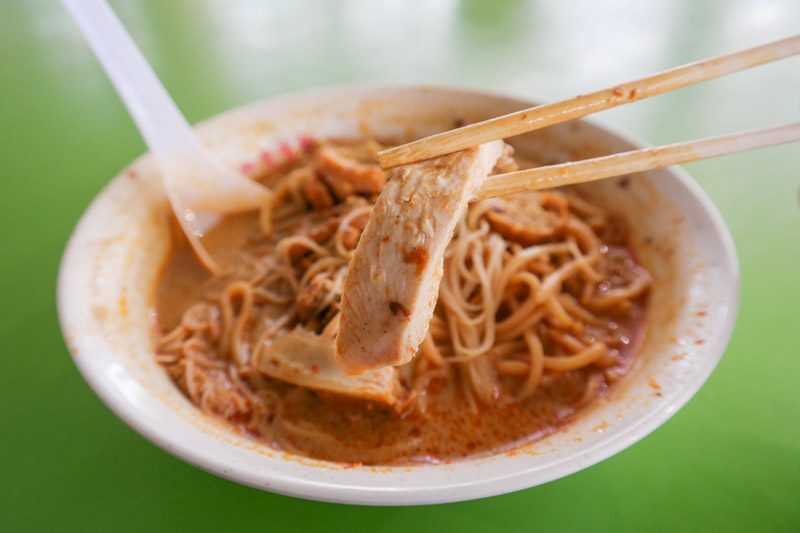 For its small price tag, this bowl of Curry Chicken Noodles really is a steal. The fragrant curry was filled to the brim, along with generous chunks of chicken, taupok, beansprouts and fishcakes. The curry was very rich and fragrant and had a very traditional and homely feel to it, just like how my grandma used to cook it. I could taste the different spices as well as the coconut milk in it, but the coconut taste was not overpowering. The curry was not spicy, but there is a bowl of sambal chilli at the front counter for you to add in according to your preference. 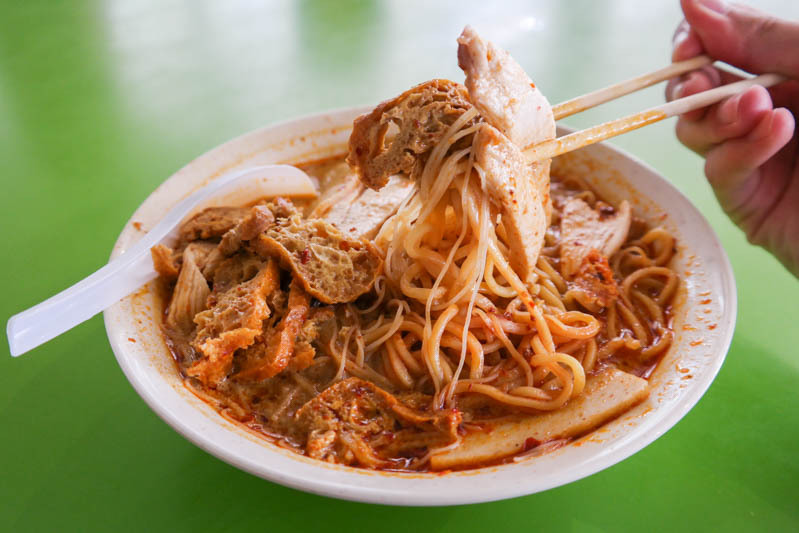 I prefer ordering a mixture of yellow noodles and bee hoon because I like the varying texture. This stall does it just the way I like it because the default is a mixture of the two. 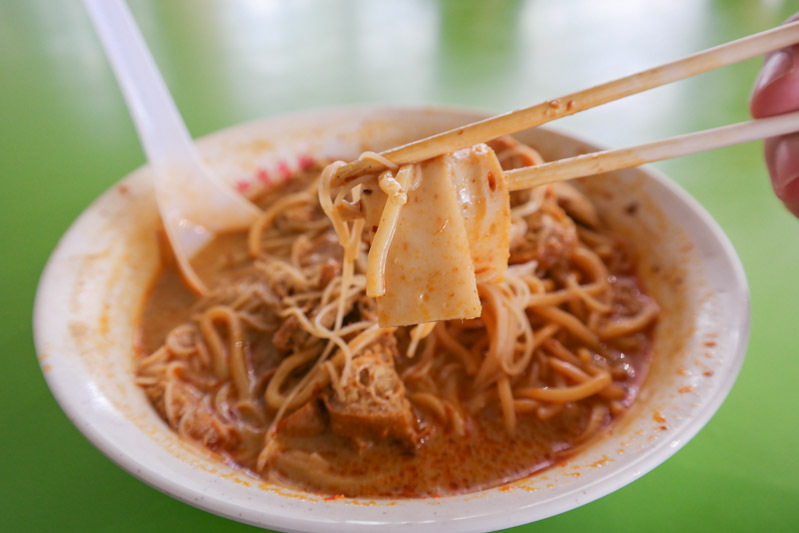 They also have the option of kway teow if you prefer. However, you can make a special request if you wish to only have one type of noodle in your dish. The noodles were also cooked perfectly and had the right amount of bite, and were not mushy at all. 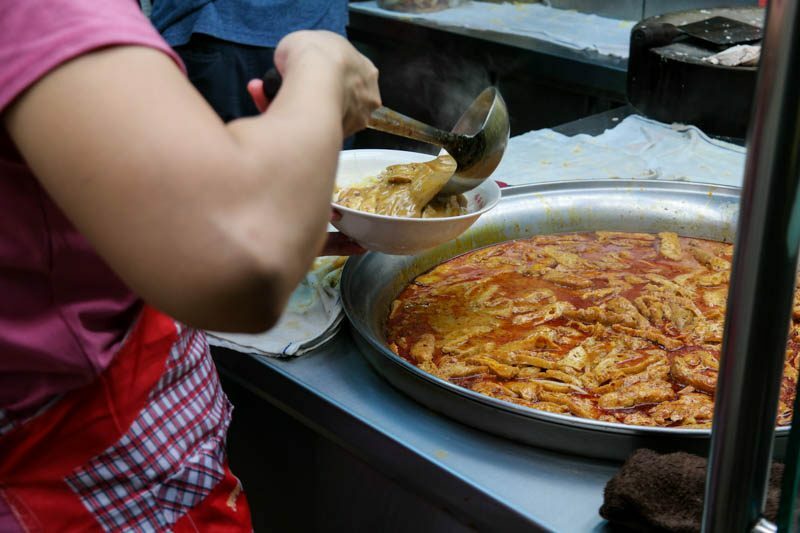 The meat given comprises mainly of chicken breast, and the skin was removed from the meat so it was not fatty at all, perfect for health conscious people. Despite being strips of chicken breasts, the meat was not tough or dry at all. It even soaked up the curry thoroughly to give it more flavour. The fishcakes were perfectly QQ as we Singaporeans would say, and tasted fresh, without any fishy taste. The taupok soaked up the curry well, and gave bursts of flavour when I bit into them. I loved every bit of this bowl of noodles, but my only qualm was that my bowl did not have any potatoes. Potatoes are traditionally included in Curry Chicken dishes, so it would have been nice to have them in my dish too. 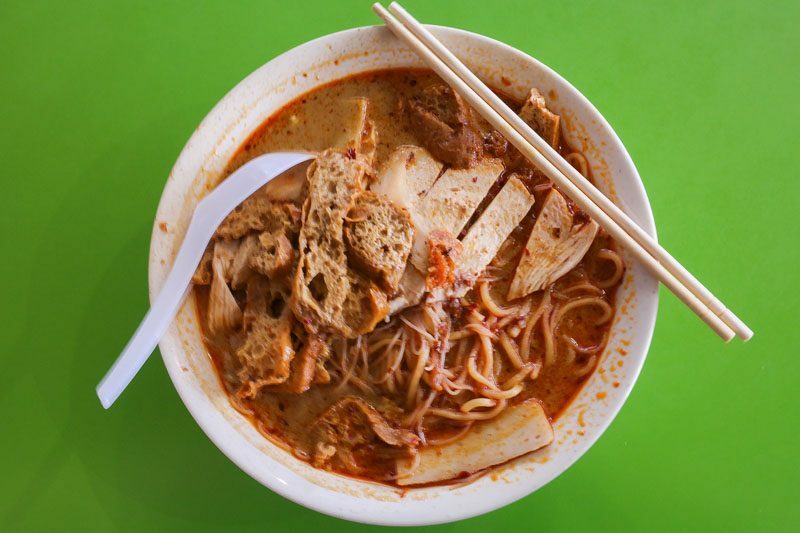 Hock Hai Curry Chicken Noodles serves up humble comfort food at a reasonable price. 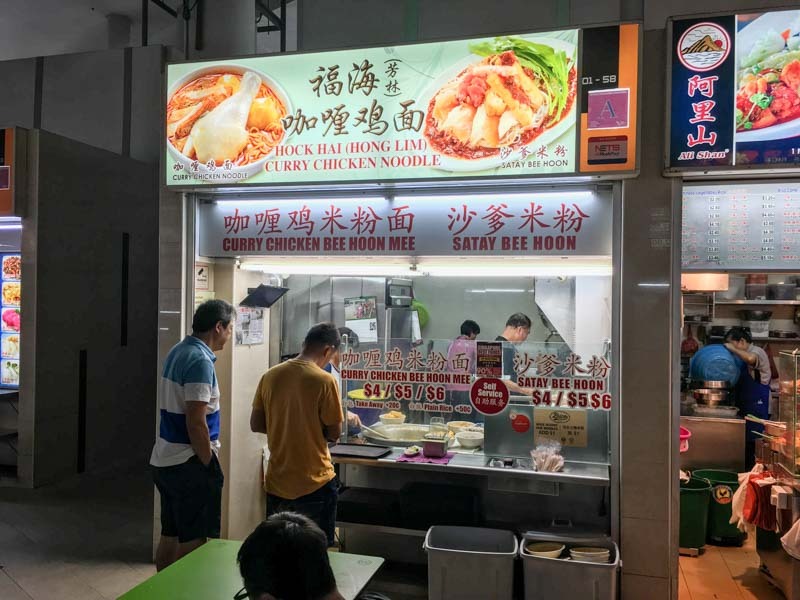 It is difficult to find affordable and good hawker fare these days but this stall is definitely one of my favourites and I hope that it sticks around for many more years to come. Head on down and have a taste for yourself! Just someone from the sunny island who's eating cake when she's not baking them.